3 Bedroom Terraced House For Sale in Basildon for Guide Price £280,000. With a single storey extension to the rear you now have all the living space you could ask for. The generous open plan lounge diner is an ideal reception area for all the family. 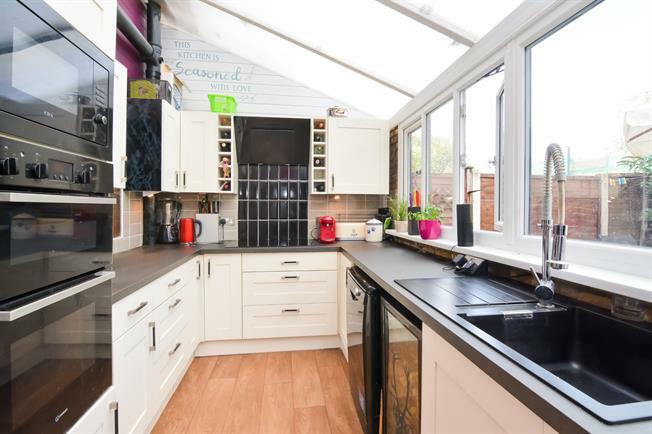 The kitchen has been done to a high standard while overlooking the low maintenance rear garden. With a downstairs WC, utility room, 3 spacious bedrooms and 3 piece bathroom suite this home has all the makings of a forever home. Externally the property boasts a patio area to the rear garden as well as summer house and a garage to the front with the added benefit of off street parking. Radiator and electric fire, carpeted flooring, under stair storage, artex ceiling, original coving, downlights. Touch flush, wash hand basin. Double glazed window facing the rear overlooking the garden. Vinyl flooring, tiled splashbacks, wall lights. Wall and base units, inset sink with drainer, integrated, double, microwave oven, integrated hob, over hob extractor, space for dishwasher. Double glazed window. Heated towel rail, vinyl flooring, tiled walls, painted plaster ceiling, original coving, downlights. Touch flush, wash hand basin. Double glazed window overlooking the garden. Radiator, carpeted flooring, artex ceiling, original coving, ceiling light. Double glazed window. Heated towel rail, tiled walls, artex ceiling, original coving, ceiling light. Touch flush, panelled bath with mixer tap, shower over bath, vanity unit and top-mounted sink with mixer tap, extractor fan.